Create an ice cream paradise! In Anna's Ice Cream, help Anna show her kindly uncle that he doesn’t need to sell his life's dream - Ice Cream Island - to his cruel competitors when he retires. As Anna, you will run an ice cream paradise on a beautiful tropical island with six ice cream bars located in different amusement areas and challenge your entrepreneurial skills in this fun and fast paced game! Make delicious ice creams with a large assortment of flavors, toppings and decorations and serve many different quirky customers. Blend new ice cream flavors in the mini-game and upgrade your ice cream bar to make your customers happier and increase your profits. Visit the circus and train your monkeys’ different tricks to further entertain your customers! 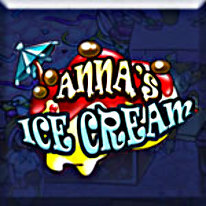 Anna's Ice Cream is a charming game of crazy ice cream making fun!